The time between a private equity group (PEG) buying a business and selling it again is typically referred to as the holding period. 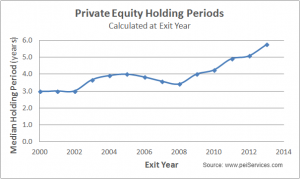 Most people think of a private equity holding period as between 3 and 5 years, given that a PEG typically has limited partners (investors) who want to see their money returned to them, with capital appreciation, and within a reasonable period of time. As can be seen on the chart below, the median holding period has doubled in the last 10 years from around 3 years to almost 6 years. In some respects, this chart is countercyclical, with hold periods being shorter in a booming economy, as PEGs are able to realize an oversized gain in a shorter period of time and want to lock in that profit by selling the company, but the trend is still moving higher. One other reason for the rising trend is that PEGs are having to do more to differentiate themselves than they did 10 years ago as the PEG marketplace has become more crowded, with more participants and more competition for the best deals, which often leads to higher prices being paid and a longer holding period to make a gain on the invested capital in the business. Should I even consider PEGs if they have a short holding period? If you take the median of 5 or 6 years as the hard rule, then this holding period could cause a significant and legitimate concern among business owners. If a business owner is considering private equity groups as a prospective buyer of their business, do they want to sell their business and leave behind the legacy they have built and employees they have cared for, to then see a PEG acquire their business and flip it for a profit as soon as possible? However, this preconceived notion of PEGs is certainly not true for all PEGs, many of which operate responsibly, with integrity and with a longer-term horizon. Furthermore, there is no hard rule to apply to this asset class, and to make a determination whether or not to consider a PEG as a prospective buyer, based upon the median hold period, would be to make a one-dimensional decision. As a couple of extreme examples, Kohlberg Kravis Roberts exited their stake in Primedia (formerly K-III Communications) in a $525 million sale in 2011 after owning the company for 22 years. On the other end of the scale, Castle Harlan flipped their acquisition of Norcast Wear Solutions in 2011, to Bradken Ltd for $217 million, having owned the company for only 24 hours and making a gain of $27 million in one night. The reality is that while the current median hold period is almost 6 years (and increasing), there are hundreds of groups at either end of the scale that can be a great candidate as a long-term buy and hold investor, or alternatively a short-term liquidity provider. The challenge for the business owner is to find an advisor that knows the marketplace and can plan and navigate the approach, interaction and negotiation with private equity groups and/or strategic buyers to find the best fit between a seller’s wishes and the prospective buyer’s profile; while at the same time ensuring a discrete approach and confidentiality throughout the process. To take it to another level, there are also variations on the PEG theme, with some wealthy individuals, family offices and foundations looking to buy and hold for an extended period, as well as some public companies that are set up to invest in private companies, oftentimes with longer hold periods, during which time they will be paying dividends to shareholders. As I’ve touched on above, there are many different business models and profiles within the private equity world and you need to know each firm and understand their focus before you can find the right buyer for the right business.